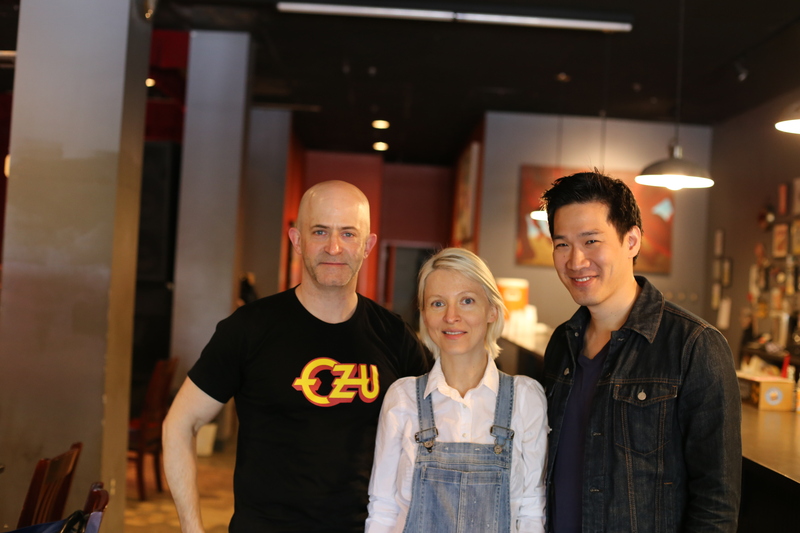 I met with co-directors, and wife and husband, Livia Ungur and Sherng-Lee Huang at the Maryland Film Festival on Sunday, May 8, 2016, to discuss their feature-length movie Hotel Dallas, a hybrid of documentary and fiction filmmaking, about the obsession with the American television series Dallas in 1980s Romania, and so much more … I also wrote a review of the film. Here is a condensed digest of that conversation. Hammer to Nail: So you are the first wife-husband duo that I have interviewed! I was wondering if we could start out talking about how you two met and decided to become collaborators. LU: So we met in New York, in 2007. At the time, Sherng-Lee was making videos, working as a videographer. I was working for a non-profit, not really involved in filmmaking, or the arts, at all. S-LH: And the filmmaking I was doing was not very creative. It was more corporate and commercial at that time. LU: So, we met through Match.com…(laughs)…and it just happened that I decided to go back to school for art, and then I got interested in video art, and that’s how I got to making Hotel Dallas, via video art. HtN: So you had not come from Romania to the United States in order to make films. You didn’t come for art school. LU: I won a green card. That’s actually in the film. But I was planning on continuing my studies. That was the plan. But when you’re a first-generation immigrant, things can move slowly…(laughs)…because you also have to work. HtN: In Romania, had you been studying art, or filmmaking? LU: (laughs) Well, that’s what all the old white men would like us to believe…(laughs)…so I really got disillusioned with art, and I didn’t really know where my place was, next to Picasso…obviously. So I got into studying English literature and history, which might have been a strange combination, but really provided a good background, for me. HtN: How about you, Sherng-Lee, what’s your academic, or creative, background? S-LH: I went to Amherst College. I was an English major. After college, and during college, a bit, I started getting in to filmmaking, but I wanted to be a conventional, narrative, Hollywood filmmaker. Honestly, I don’t think I was that good at it, and I kind of cycled through a series of collaborators – you know, it’s impossible to really make a film of that nature on your own – and I think by the time I had met Livia, I’d kind of reached a dead end. It just didn’t seem like it was going forward. And so I had kind of moved more into just trying to pay the bills, make a living, doing corporate commercial stuff. I mean, I think there are a lot of people in this world who have talents, who have knowledge, but they need a collaborator to make it complete. I think there are some people who are just going to be successful, no matter what, but I think for others, you either keep searching for collaborators or you luck upon them. In my case, I just married the person, and then we started collaborating. So it was really after we got married, she’d gone back to school, and then she really just needed production muscle, basically, like someone to come and push the buttons. That’s how it started, and it was all her concepts from the beginning. But then I started thinking more along creative and artistic ways of trying to manipulate the language of film and it gradually became more of an equal collaboration. LU: Right. We were also living together, and kind of just bouncing ideas off of each other, and I think the trust – the kind of, like, creative partnership that’s built on trust – was really important from the beginning. S-LH: Right. And she was in school this whole time, but I think it just got to a point where, you know, the input from me, as the collaborator, would carry more weight than the input that she’d be getting from people who were alongside her…“more like her,” like being an artist. So it was a long transition period before I was even comfortable saying, OK, I’m an artist, too. But it was really just with Hotel Dallas…(laughs)…where I started saying, yeah, we’re an artist duo, named Ungur & Huang! HtN: Before we talk about the genesis for the film, Livia, where did you end up going to school, here in the States? LU: I went to school, for undergraduate, to Hunter College. That’s where I got my BFA, in time-based media. And then, I went to the Yale School of Art for my Master’s Degree. HtN: Was that in filmmaking? Do they have a Master’s in filmmaking? LU: No, so it was an MFA in the Yale School of Art, and I was in the Sculpture Department. HtN: Interesting! So let’s talk about the genesis of Hotel Dallas. You guys get together, you’re living together, you’re bouncing ideas off of each other…How do you come up with this crazy idea for a film nominally about Dallas in Romania in the 1980s, but about so much more? LU: Well, the project kind of started with…there was an opportunity for a travel grant, when I was at Yale, in my first year, and so I had to come up with an idea for a project. And I was born in Romania and grew up in the early ‘80s, and that’s when Dallas was on TV. It was the only American TV show allowed by the censors. We had two hours of television: one was state-controlled news, and the other was Dallas. (laughs) So there was really, for me, this experience of watching Dallas and seeing America…those were the first images of America…and it kind of helped implant this seed, this desire to emigrate to the U.S…. (laughs)…for me. Another layer of the project was this replica of the Southfork Ranch that this very rich Dallas super fan built in Romania. And I was aware of this replica, but I had never visited it. So it seemed like a good fit to go to Romania with a travel grant and do something at this ranch. But then we kind of started, over dinner one night, developing the idea, and this crazy idea of what if we use the death of Bobby Ewing, from Dallas, and try to find out what happens to Bobby Ewing during the dream season, when he’s not in Dallas. Maybe he wakes up in Romania, in this replica of the Southfork Ranch. (laughs) So, that’s kind of how it started. HtN: Had you watched Dallas on your own? S-LH: I’d watch Dallas as a kid, and it’s probably one of the earliest memories I even have of television that wasn’t a cartoon. LU: (laughs) He had more choices than me! S-LH: (laughs) Right, right! And it was probably more mid- to late ‘80s that you became aware of Dallas, right, rather than early ‘80s? LU: Probably ’86 to ’89. S-LH: Like, really the last years of Communism. HtN: And [Romanian dictator] Ceaușescu is overthrown and executed in ’89, right? S-LH: But I would say that in terms of that main vision, the three main pieces – the hotel, Livia’s childhood, and Bobby Ewing – that was really all Livia’s…it just came out, all in one night, basically, it all just came together. HtN: Where is that Endless Column located? LU: It’s in a public park in this town called Târgu-Jiu in the Southwestern part of the country, and there are three monuments, actually, and they are all in the film: the Gate of the Kiss, which was that big stone gate; the Table of Silence; and the Endless Column. It was conceived as a monument for fallen World-War-I soldiers, by Constantin Brâncuși, a major Romanian figure. HtN: So you have this idea. How did you come about this completely hybrid mixing of staged elements and documentary elements? How did you decide on the structure of the film? S-LH: I think that’s probably where my contribution started becoming more important, just conceptualizing how to make it happen, how to give it a shape, and I think the hybrid form was really…I mean, form follows function, you know, and the whole thing, from the beginning, was really about how fantasy shapes our realities, and vice versa. I mean, to me, it’s not that interesting of a question to lay out a hybrid film and go, oh, I couldn’t tell what was real and what was not. I mean, that is kind of cool, but ultimately, it’s like, well, why? Why are you confusing things? S-LH: Yeah. So I think, in the film, sometimes it’s confused, but often it is very clearly delineated. Like a lot of our dream sequences literally start with the guy saying, I had a dream. (laughs) You know, like we’re not trying to make you guess whether you’re in the dream or not. And so we were really interested in exploring the mechanism of how those two parts work together. And also…I feel like the film is very dreamlike, like it’s obviously a very surreal journey, but you keep waking up. We keep snapping you out of it with these little documentary segments. We just keep interrupting you. That was something that kind of really goes back to the history of video art, which was always kind of, from the beginning, trying to work against the seductiveness and the passive viewer. They were trying to wake people up out of their viewing complacency and make them more active viewers, or whatnot. The problem with that model is that, first of all, hardly anyone sees video art, because it’s sort of ghetto-ized into a gallery setting, and then the other part is that most people who do see it, who don’t know much about art, kind of find it very boring. S-LH: Right. Too much of a turn-off. So I think, for us, what we were trying to do, by constantly changing it up and attacking it from new angles, was to keep people interested. We were trying to make it challenging, but also seductive. Seduce them and challenge them, and seduce them through challenge! So that was always the goal, I guess. When you do that, you’re always kind of imagining what your audience’s tolerance for weirdness or strangeness or adventurousness is, and ultimately, you can’t really predict how people are going to react. You just have to set a sort of standard within yourself, and kind of go on faith. I think for us, as artists…you know, I’ll go into a video art piece and sit there for an hour. I think I have a fairly long tolerance for it, but I’m still very conscious of my waning attention span and I’m very conscious of…you know, our world is so full of art and messages and images…there’s always a reason to look away. We try to give them a reason to look harder and closer. LU: I mean, that said, I feel like, personally, I do like being slowed down. Our film has a very different pace from, I don’t know, like a Chantal Akerman film, for example. So there’s room for all kinds. S-LH: Yeah, absolutely. We don’t exist in a vacuum. LU: But I think the hybridity also came from the process of how we shot the film, how we made the film. You know, when we went to Romania, we really had a three-page outline. And so it was a process of discovery on this road trip that we took through Romania, and the process of casting the actors, and all the interviews that ended up in the film are actually just audition interviews. We interviewed the actors about their memories of Dallas. There were some really interesting moments, like the one where the woman talks about the cheese wheel, and that’s how we kind of got to including more of the documentary elements. Initially, we really that we were making a fiction film. S-LH: You know, I think the creative process is always a combination of your high-level ideals of what you want the film to be and then it’s reacting to what you discover as you go along, and also just working against and with the limitation that you’ve had from the outset. There’s a very practical reason for the hybrid approach, as well, which is that there was just so much information, and so much backstory, that we had to just get out there. You know, a lot of times, in a historical film, you’ll just have a text card, in the beginning, that reads, it was the time of the Punic Wars, and this is happening and this is happening…and Livia, whether it was just instinct or something else, just said no, we’re not doing that. Whatever explanations, whatever exposition we’re going to have in the film is going to have to come about the fabric of the film language. 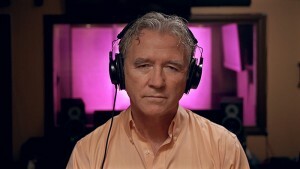 HtN: One final question, speaking of seduction: how did you “seduce” Patrick Duffy into joining your film? LU: Hmmm…(laughs)…well, we were always thinking that Patrick Duffy was really the only person who could play [the character in the film named] “Mr. Here.” But it seemed like, you know, a fantasy. (laughs) It was a crazy idea! And we shot the whole film without him. LU: And he said, well, I’ll do it, and just bring me a bottle of wine. And that was his payment. HtN: Wow! That’s very sweet of him. Well, thanks for giving me the time. It’s been wonderful, and congratulations on your mesmerizing film, and I hope you continue to have a great run with it. LU and S-LH: (together) Thank you so much!